Human Genome Informatics: Translating Genes into Health examines the most commonly used electronic tools for translating genomic information into clinically meaningful formats. By analyzing and comparing interpretation methods of whole genome data, the book discusses the possibilities of their application in genomic and translational medicine. Topics such as electronic decision-making tools, translation algorithms, interpretation and translation of whole genome data for rare diseases are thoroughly explored. In addition, discussions of current human genome databases and the possibilities of big data in genomic medicine are presented. 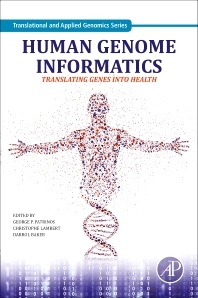 With an updated approach on recent techniques and current human genomic databases, the book is a valuable source for students and researchers in genome and medical informatics. It is also ideal for workers in the bioinformatics industry who are interested in recent developments in the field. Dr. Christophe G. Lambert’s research interests span bioinformatics, cheminformatics and clinical research informatics. He has spent his career developing informatics solutions for biomedical research that has been used by thousands of scientists. Associate Professor, University of New Mexico School of Medicine, USA and Founder and Chairman of Golden Helix Inc.
Darrol Baker’s research interests focus on bioinformatics, particularly in making lifestyle decisions based on genomic information.